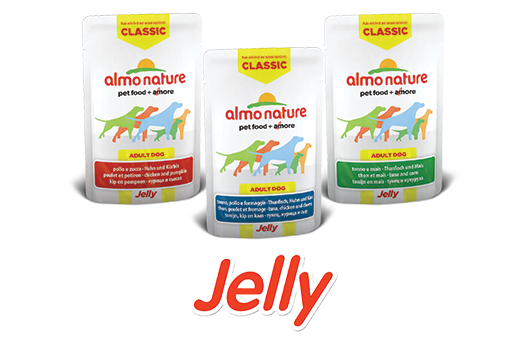 Free from chemical additives, preservatives, palatants or colorants. Free from chemical preservatives, palatants or colorants. Recipes prepared with carefully sourced meat or fish and derivatives. 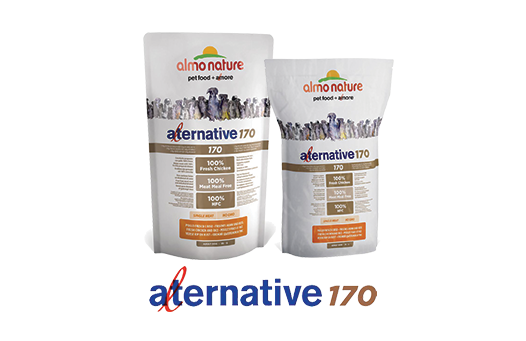 Alternative 170 is different from all other dry foods available today, thanks to the use of only fresh chicken and the absence of meat meal or dehydrated meat: it improves the daily nutri­tion of all dogs. 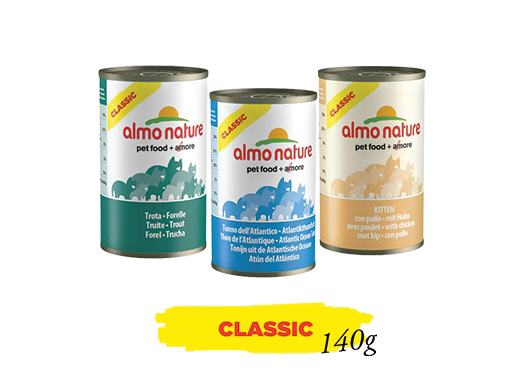 Alternative 170 is recommended for dogs hypersensitive to foodstuffs. 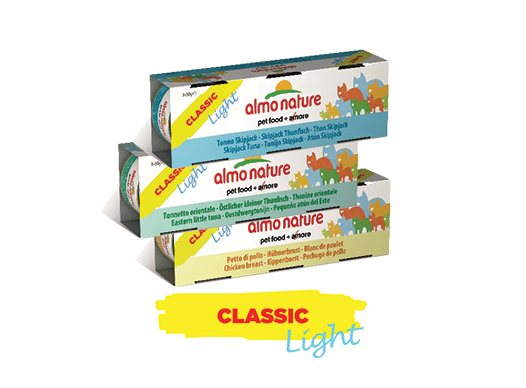 No chemical preservatives, colouring agents or taste enhancers. 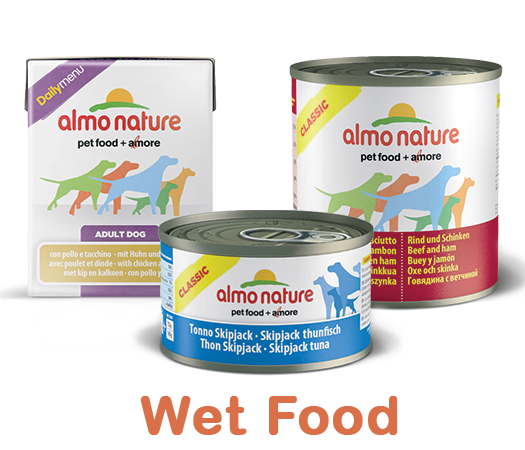 The meat / fish and rice used in the kibble originated from the human food chain. Alternative is a Single-Meat / Single-Fish product be­cause it contains per recipe only one single source of protein of animal origin. 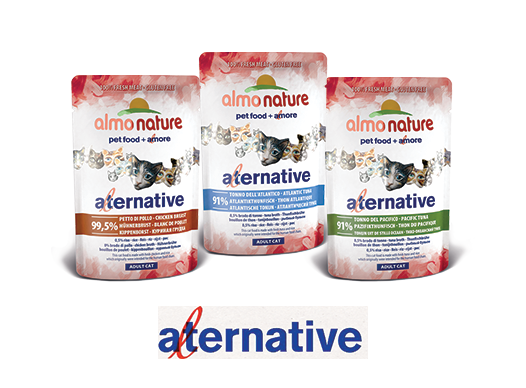 Alternative is a gluten-free product as it contains rice only as a source of grain. 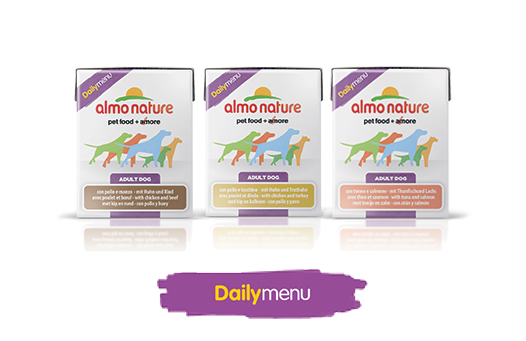 Alternative is different from all other dry foods available today, thanks to the use of only fresh lamb and the absen­ce of meat meal or dehydrated meat: it improves the daily nutrition of all dogs. 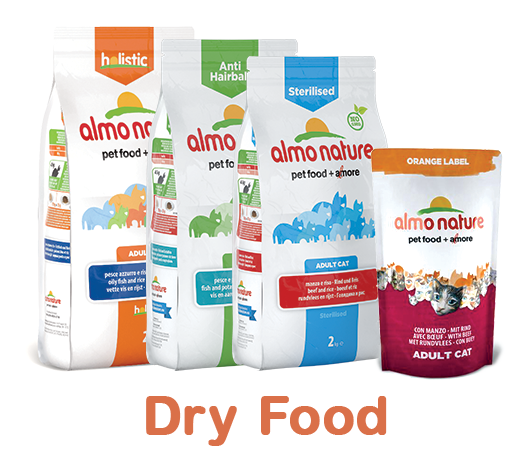 Alternative is recommended for dogs hypersensitive to foodstuffs. Contains chondroitin sulfate and glucosamine. 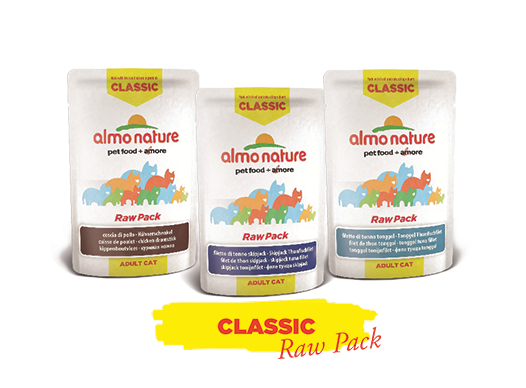 Raw Pack cooking method: meat is packed raw and then cooked in its pouch through a high temperature sterilization process. More flavour and perfectly preserved nutrients for a more natural meal. 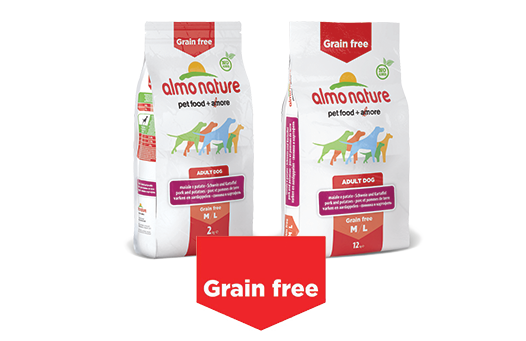 *Almo Nature chooses to use as pet food in this recipe, meats and rice that originally came from human food chain. 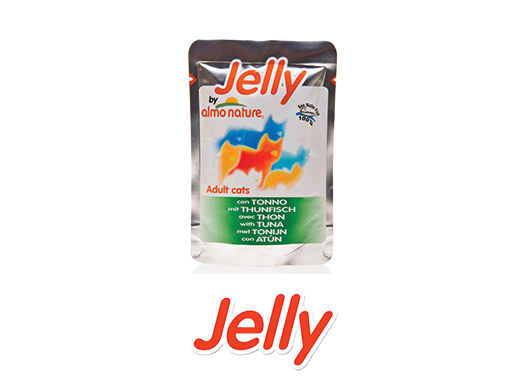 Richer in juices: it stimulates cats to drink and hydrates them in a natural way. 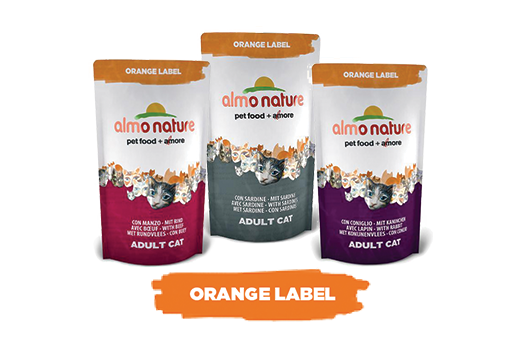 All the benefits of natural wet food: natural hydration and noble nutrients. 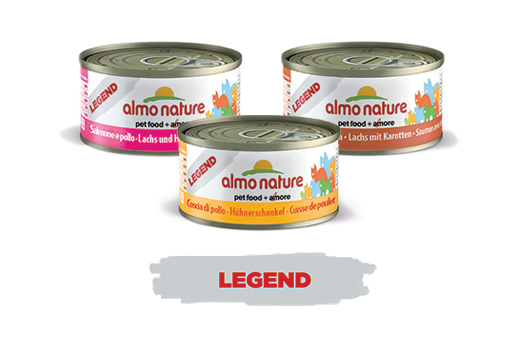 Light recipes: prepared with particularly lean meats are ideal for overweight or elderly cats. 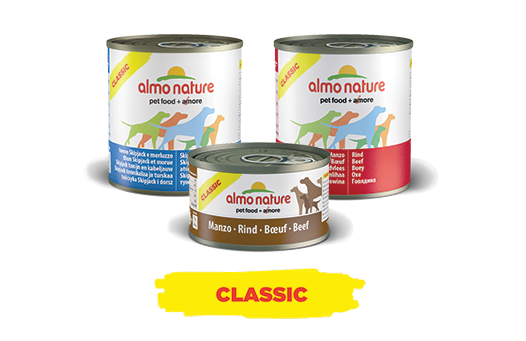 Premium-quality ingredients suitable for pet food only. Free chemical preservatives, palatants or colorants. PURE! free from chemical additives, preservatives, palatants or colorants. 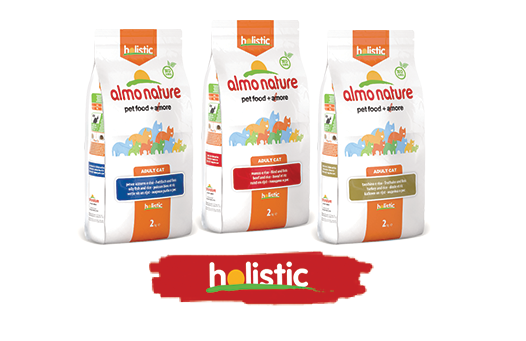 HOLISTIC CAT NEW IMPROVED FORMULA! 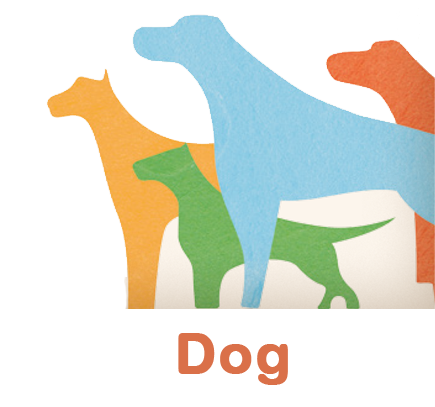 Holistic kibbles have a high content of fresh quality meat or fish,cereal and only nutritional additives. A high percentage of fresh meat and all the proteins come from animal source. Multiprotein to ensure a complete aminoacidic profile. 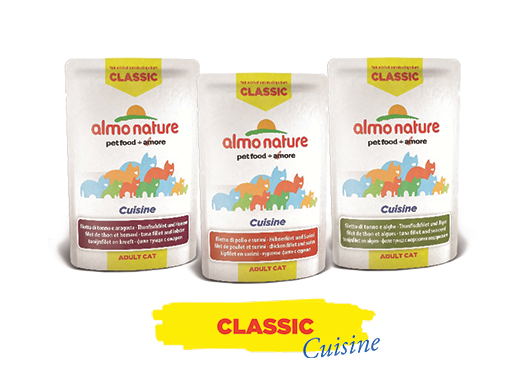 Multiple protein sources, coming from dried meals and fresh meat, give to Holistic Cat all micronutrients naturally present inside a given meat: no need to add as an integration, higher bio-availability! 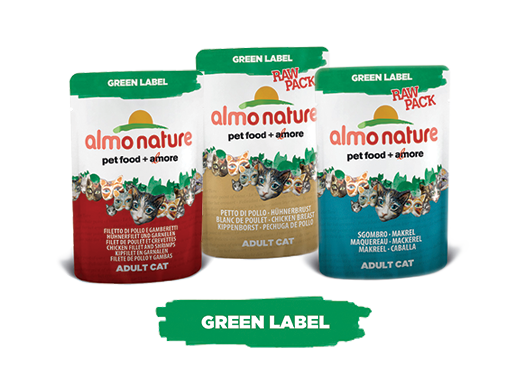 STERILISED is a functional dry food for adult cats. 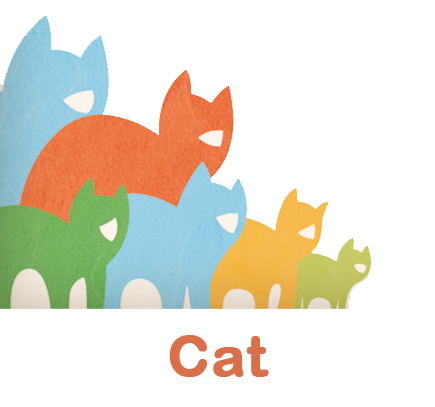 Sterilised cats have a higher risk to gain excess weight and to develop urinary tract diseases. 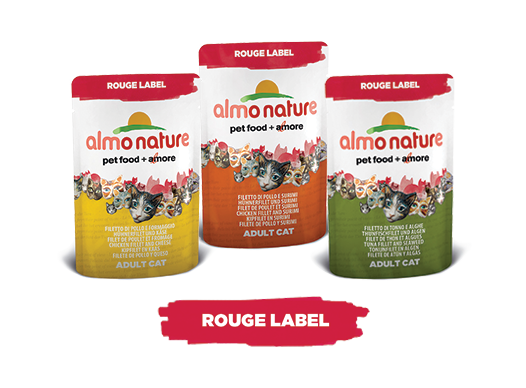 The high percentage of fresh meat and fresh fish makes the food more tasty and digestible for the cat. 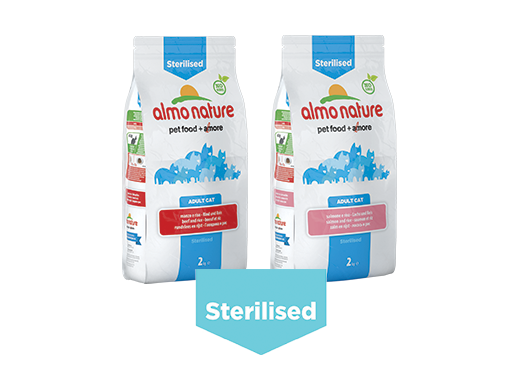 The low magnesium content makes STERILISED an ideal diet for all cats including sterilised cats. 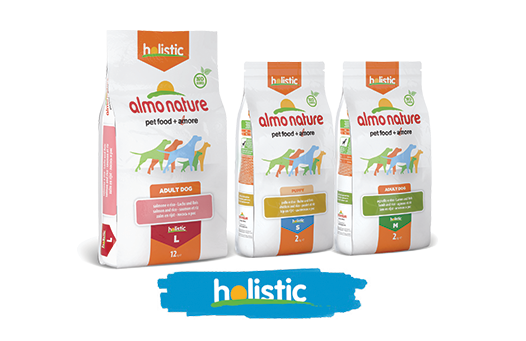 Optimised mineral composition to support ahealthy urinary tract. 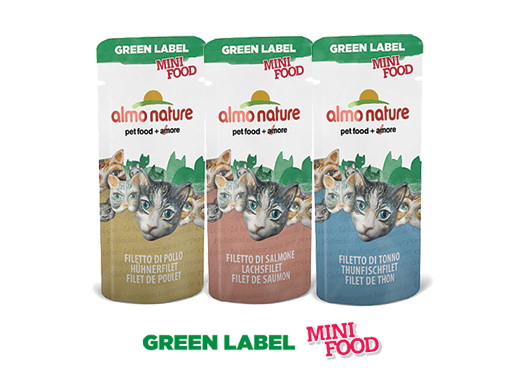 NO GMO: all kibbles of the STERILISED and ANTI HAIRBALL line are produced in a plant, which does not use genetically modified organisms. 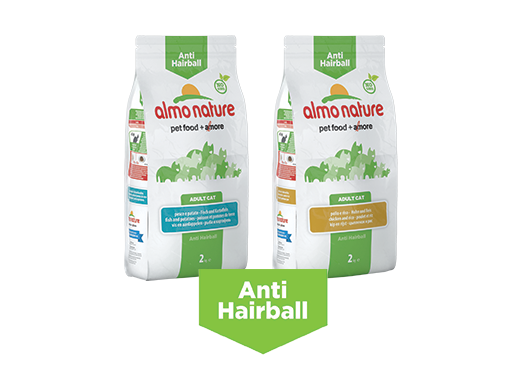 ANTI HAIRBALL is a functional dry food for adult cats with an optimal mix of fibers consisting of cellulose, FOS (Inulin), MOS and Yucca, which have a preventive effect against hairball occurrence within the intestines and facilitates their passage through the digestive tract. 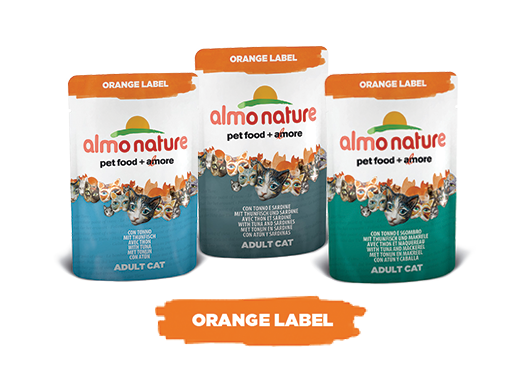 The high percentage of fresh fish and fresh chicken makes the food more tasty and digestible for the cat. 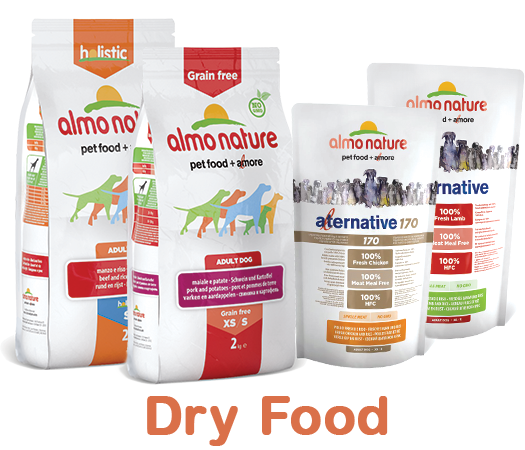 NO GMO: all kibbles of the STERILISED and ANTI HAIRBALLline are produced in a plant, which does not use genetically modified organisms. 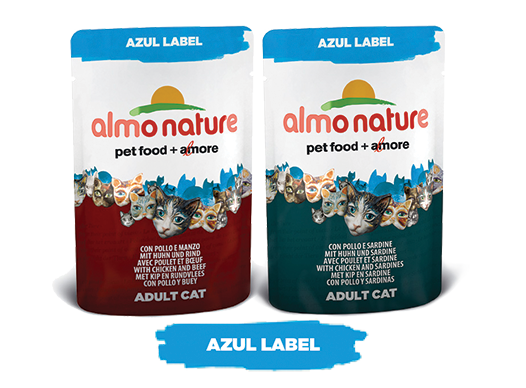 Recipes contain premium ingredients that are suitable only for pet food. 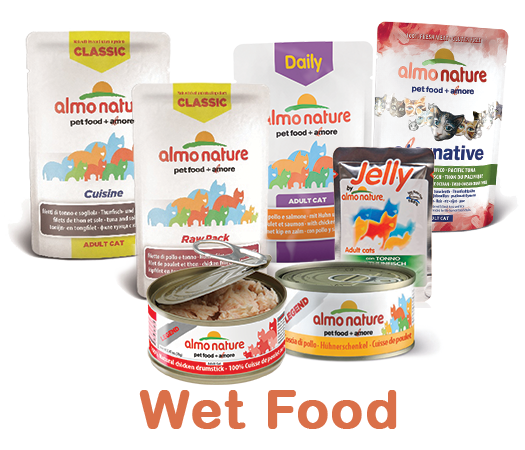 The addition of minerals and vitamins completes their nutritional profile. 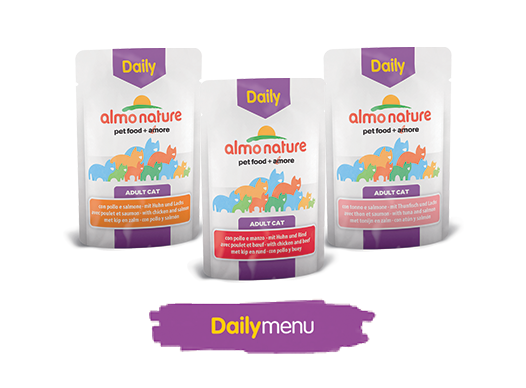 Vitamins, minerals and taurine to complete the nutritional supply (Nutritional additives). Vegetal fibre for jelly formation (technological additives). 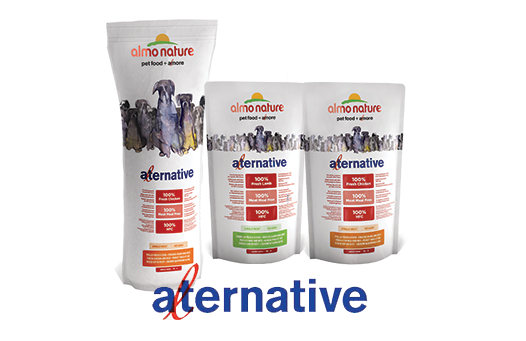 Almo Nature never uses chemical conservants (BHA, BHT), colourants or other chemical additives to improve product cosmetics.